Android OS providers countless games in the market. But there are only very few games which are reaching users (customers). I'm going to take you through a very good android game called "Fruit Slice". 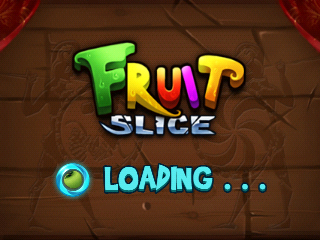 Fruit slice is a very nice game. 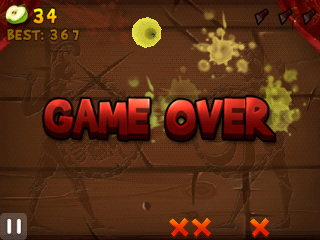 The main aim of this game is to slice the fruits that are appearing on the screen before they disappear (fall down). This game can be played in 4 different modes. Here the Fruit slice screen home page. As you can see on the above screen, there are three options on the home screen of Fruit Slice - "High score", "New Game", "More Games". If you choose "New Game", below screen appears to choose the mode of the game. Classic mode: This mode has 3 lives i.e. ; you can miss three fruits in a row. So, fruits will continue to jump on the screen. And user has to slice these fruits before they fall down. Suddenly, few bombs will appear on the screen along with fruits. If user slices the bomb, game will be over. 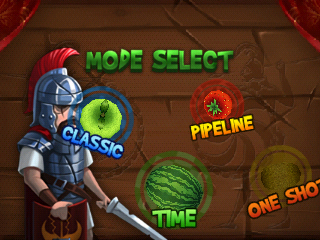 Time mode: This mode will allow user to slice the fruits within a given time. Pipeline: This mode will show a pipeline on the top right corner of the screen with the fruit sequence. 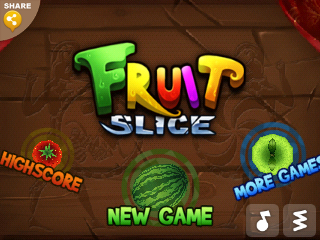 And user has to slice the fruits in the same sequence. Pipeline can only fit in with 5 fruits. When fruits are overflow, game will be over. 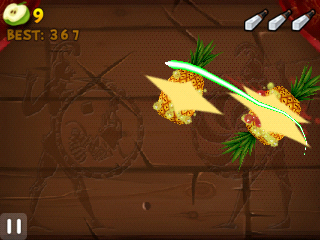 One shot: This mode will show all the fruits which need to be sliced on the screen at a single point of time.